The crackle studs are a new BPS product. In this wheel, you have 2 shapes (round and square) and each one is available in 6 colors: white / gold / green / red / pink with black crackle, and light blue with copper crackle. As I already had Chanel Fantastic on my nails, I chose to use the gold / black studs. I added some gold on my middle and ring finger with China Glaze Passion. 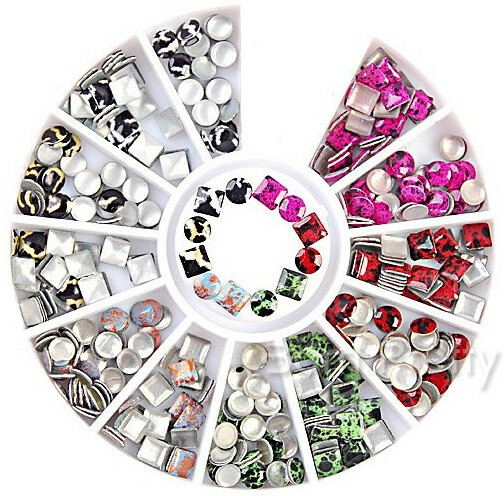 You can buy this wheel of 300 studs on bornprettystore.com for $3.29. And if you use my code "AAL91" you'll get 10% off. * These studs were sent to me for my honest review. Please see my disclosure page for more information.